Purchasing a bottle of wine is just one component of a much bigger picture. Questions still remain as to how you plan on enjoying the juice inside. Will the Hogue 1997 Chardonnay be poured for dinner at your home or at a friend’s? Is the St. Francis 1995 Reserve Merlot to be enjoyed in front of the fireplace, or will you save it until American Beauty comes out on video? What about drinking that Cline 1997 Fulton Road Zinfandel with your famous barbecued ribs? Or the 1996 Staley Mourvedre with that to-die-for chocolate dessert? 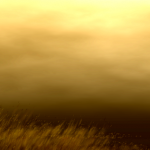 The possibilities seem endless. Yet one crucial factor remains: How will you get the bottle open? The less problematic, the better, right? Aside from finding an absolute gem — perhaps a patented English-made screw pull dating back to the 1800s purchased at an antique shop — it’s best to examine what corkscrews are most useful and readily available. 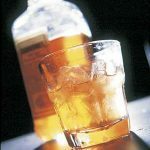 The products listed below are widely sold at many winery and wine retail shops. 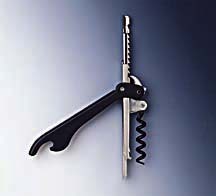 There are many different models of this opener, ranging from the fold-out screw on a Swiss Army knife to a polished wood or silver model with a Teflon-coated “worm” (the helix-shaped spiral screw). Most come in a plastic cylinder form. You pull the worm out of the tube. Insert the tube through the hole above the screw. Screw the worm into the cork, and gingerly tug the cork out. Pros: The most basic device available. Cons: Very minimal. Ninety-nine percent don’t have a blade/foil cutter or bottle opener. Unless done gently, an irritating “pop” sound might be taken as gun fire by your guests. Rating: Use in case of emergency. Dating back to the late 1800s, this hand-held corkscrew has become a mainstay for waiters opening bottles at the table. Most are equipped with either a straight or serrated knife blade, which serves to cut the foil. 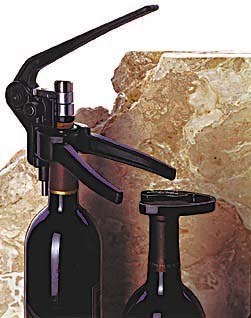 Pros: The hinged lever takes pressure off extracting the cork. The lever can also operate as a bottle opener. Cons: If not used properly, the lever can chip glass from the bottle’s neck. Cutting the foil must also be mastered or else you might as well keep using the T-shaped model with a separate foil cutter. This two-prong extractor works around the cork instead of through it. 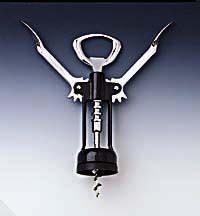 To operate, you insert the longer prong first (between the cork and the bottle neck) and then the shorter prong. Then gently rock the handle, “walking” the prongs down. When completely in, twist the handle and slowly pull the cork out. Voila! 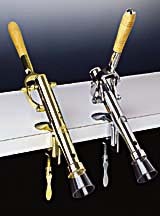 Pros: This tool can be useful in retrieving sunken corks and extracting older corks that may be unstable and break apart when you use a worm. And, if you reverse the extraction method, you can put corks back into the bottle. Cons: Another opener that requires getting used to. Patience is certainly required. Also, doesn’t work well with synthetic corks. A tool that should’ve been invented centuries ago! It’s a Waiter’s Friend with a foil cutter (instead of a blade) attached. You really don’t have to worry about a clean foil cut. Instead, you merely tighten the attached cutter around the top of the bottle and twist. Perfect foil cut! Sometimes called an “angel wings” screw. Operates with two levers on opposite sides of the handle. Process is basic: Set the tool on top of the cork. Twist the handle clockwise until the worm is fully inserted into cork. 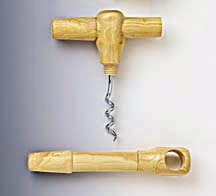 Push both levers down, and the cork is extracted. Pros: Simple. The circular base around the worm helps center the screw. Cons: Usually doesn’t have a blade/foil cutter. You also have to manually unscrew the cork after it’s been extracted. It’s common that this is forgotten until you either have to put the tool away or open another bottle. We’re talking high end! Some more high-tech than others. Springs, levers, crank wheels, clamps and Teflon-coated worms — all working together as one. Yes, baby, yes! Very streamlined. There are a number of models. The Le Creuset Screwpull is a hand-held version. Others mount to walls, counters, etc. Pros: Great for trade purposes. They’re the most efficient style of corkscrew for opening a slew of bottles. They extract the cork quickly and then remove it by clamping the grip together and pulling up the lever. We’re talking a done deal in under 10 seconds! Cons: Must use a separate foil cutter. Some need adapters for flanged bottles. Rating: Presents (to yourself, perhaps). Touch me, feel me, use me! New kid on the block. Features a retractable specialized cutter that works nicely on the lip of the bottle. Insert the worm as usual, place the opener in a vertical position (which allows the crank apparatus to appear). The entire body then serves as a ratchet lever (like that of a tire iron while changing a flat on your car) that cranks the cork out. You gotta see it to believe it. Cons: Takes a little getting used to. Rating: Very “jet-set” modern. Experimental.